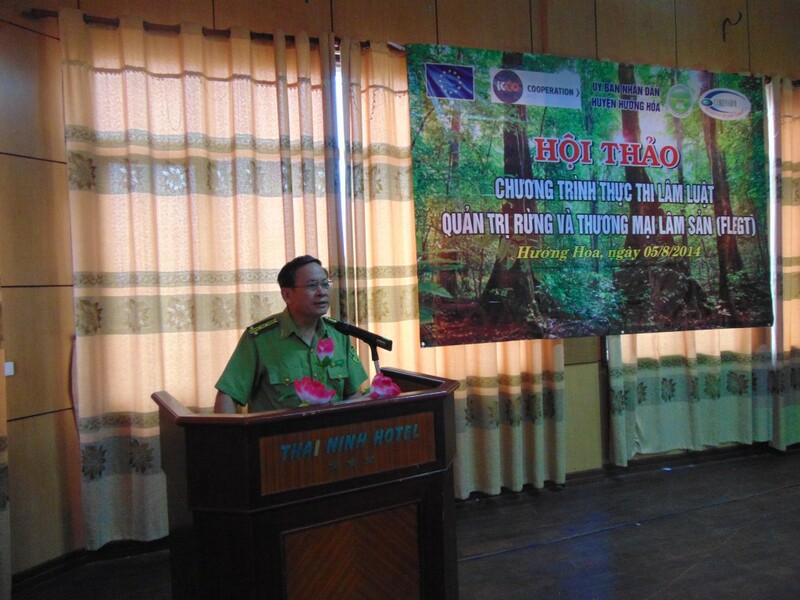 Funded by The European Union (EU) and ICCO (The Netherlands), the FLEGT Project Management Unit (PMU) in Central Vietnam in cooperation with Forest Protection Department (FPD) of Quang Tri Province and the People’s Committee of Huong Hoa District held a workshop on “Forest Law Enforcement, Governance and Trade Program” (FLEGT) on 5 August, 2014 in Huong Hoa District, Quang Tri Province. The workshop was within a series of workshop activities on FLEGT Program in 4 provinces of Quang Binh, Quang Tri, Thua Thien Hue and Quang Nam. The main objective of the workshop was to deliver a general introduction about the project “Promoting the participation of the Central Vietnam VNGO-FLEGT Network in the FLEGT-VPA process”; to provide information of issues related to negotiations and implementation of Voluntary Partnership Agreements on FLEGT program and especially to collect comments from the participants for recommendations to the negotiation and implementation of VPA/FLEGT. The workshop has attracted the representatives from FPD of Quang Tri Province, Quang Tri Union of Science and Technology Associations, People’s Committee of Huong Hoa District, leaders of agencies, chambers at district level and of Huong Tan and Huong Son Communes, Huong Hoa District, representatives of WWF Organization in Hue, representatives of households who planted and protected forest, wood processing enterprises and households who got forest stewardship certification (FSC) in Trung Son commune, Gio Linh district, Quang Tri province. Through the workshop, Mr. Truong Si Hoai Nhan – Director of FLEGT project together with the consultants from Consultative and Research Center on Natural Resource Management (CORENARM) provided the participants with the general information about FLEGT Project in Central Region, the negotiation process of VPA/FLEGT between the EU and the Vietnamese Government in implementing Forest Law Enforcement, Governance and Trade Program” (FLEGT); The European Timber Regulation (EUTR); Timber legality assurance systems (TLAS); The situation of FLEGT Program in Quang Tri Province; and the opportunities and challenges for managers and forest dependent communities when being involved in VPA/FLEGT process. Through the workshop, the FLEGT PMU has collected many opinions from the participants, which would be summarized and sent to Vietnam Administration of Forestry to contribute to the recommendations for the process of VPA/FLEGT negotiation and signing between the European Union (EU) and the Government of Vietnam in late October, 2014.